My fingertips feel a bit sore while typing this post, since me and T have now spent 6 weeks bouldering in Alcañiz. In case you haven't hear of the place, Alcañiz is located roughly 200 km from the famous Albarracín and offers you hundreds of boulder problems away from the masses. 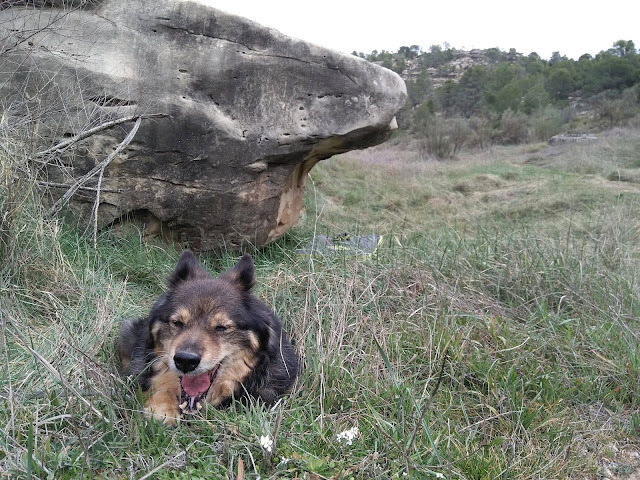 Hills and valleys surrounding the town of Alcañiz are a home for legions of liquorice ice cream colored boulders, that vary both in shape and how easy (or hard) they are to grasp. Yellow roofs, deep hollows and pockets in contrast with black, smooth slabs... Oh, and plenty of problems made for honing on your manteling skills! All on sandstone, that provides an excellent friction from autumn to spring. Alcañiz offers diverse bouldering from low 6s' all the way up to something only Nalle Hukkataival can climb. Photo from El Arenal. 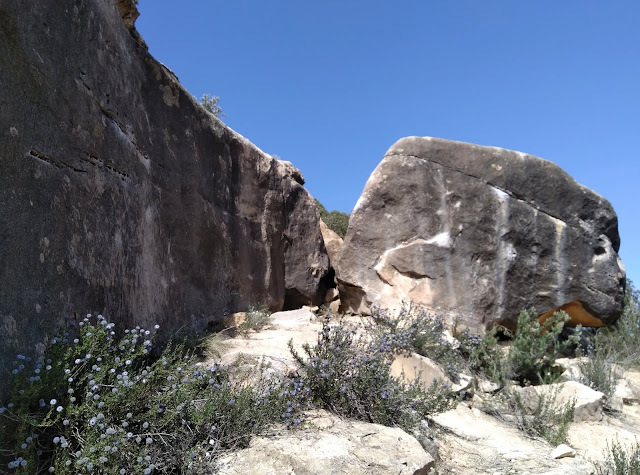 There's so much I want to tell you about bouldering in Alcañiz, that I decided to share it into two individual posts. 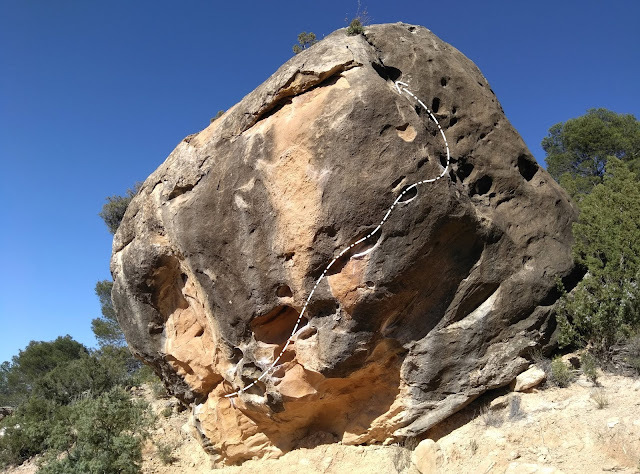 This time I'm going to get you started and concentrate on the climbing itself, whereas in the next post I will reveal some other useful tips for anyone planning to go bouldering in Alcañiz. Firstly: where to get a guidebook for Alcañiz? You definitely need a guidebook for the area of more than a thousand discovered and likely as many undiscovered boulders. At the moment it's 27 Crags, that provides you the most comprehensive guidebook for Alcañiz. 27 Crags gives you the best info on problems and access as well as detailed photos. Being and online guidebook, 27 Crags also updates as new routes are opened. At the moment I don't think it would even make sense to print a guidebook, since the area is developing all the time. You can also download an offline version of the guidebook. This feature comes in very handy, since the reception in Alcañiz is often very poor. Because of all the reasons mentioned above, I recommend buying a one month .premium membership for 27 Crags to get a decent guidebook for Alcañiz. It costs 5,9 Euros and you can access the guidebook for Albarracín for the same price. Despite our hairy local guide, an offline guidebook made climbing at sector La Bandereta much easier. There's no reception in the valley like at many other sectors in Alcañiz. When it comes to the number of boulder problems, El Anfibio is the biggest sector in Alcaniz. The vast sector following Río Guadalope hosts over two hundred problems across the grades. While El Anfibio might look very luring in the guidebook, it isn't that epic in reality. Judging by several day's of climbing there, the boulders are scattered and many problems leave you feeling a bit unsatisfied. A big part of the sector also bathes in sun for the whole day, which makes climbing at El Anfibio a challenge on sunny days. In case you end up at El Anfibio, try out the three neighboring 7a's close to the river. I didn't climb the rightmost of them, but it's siblings offered plenty of fun in the form of teeny tiny pockets! El Anfibio is so boooring! Well, at least prepare yourself for some sweaty hiking and mosquitoes. While El Anfibio is not a bad choice for a sector, there are better ones. One example is Camineros right next to El Anfibio. You can find both sun and shade at Camineros, and the sector hosts many great problems. The traversing Escapada Lateral (6c) is one of my personal favorites in the whole of Alcañiz. The lengthy Escapada Lateral (6c) has no stars in the guidebook, but I'd say it's worth one or two. El Arenal is also worth a visit. There are two more concentrated bands of boulders, that offer fun for both beginners and intermediate climbers. Go for the southern blocks, if you're looking for something to climb around 7b and the northern blocks, if around 6b. As for the best sector, one that stuck to my mind is El Bulevar. Why? Because El Bulevar has an easy access and there are plenty of enjoyable problems on flat ground close to each other. You can find both sun and shade there, but my advice is to stay close to the road – problems father away are more scattered and less climbed. In the deepest winter, La Bandereta or El Barranco del Ciego might make a good choice for a sector. They both get a lot of sun and host highly enjoyable problems within a short walk from each other. At Barranco del Ciego, La Pera Madura (6c+) is well worth a few attempts. Boulders at the top of a sunny hill at sector La Bandereta. That being said, we haven't visited every sector in Alcañiz. There are dozens of them and the number keeps on growing. Almost all bigger sectors (also the ones, that aren't mentioned here) have enough interesting problems to amuse you for at least a day. Just remember to watch out for scattered blocks and rough roads! This cool block can be found at the sadly scattered sector of Val De Sincesta. Route marked on the photo is Signo Positivo (6b), which is IMO one of the best easy one's in Alcañiz. 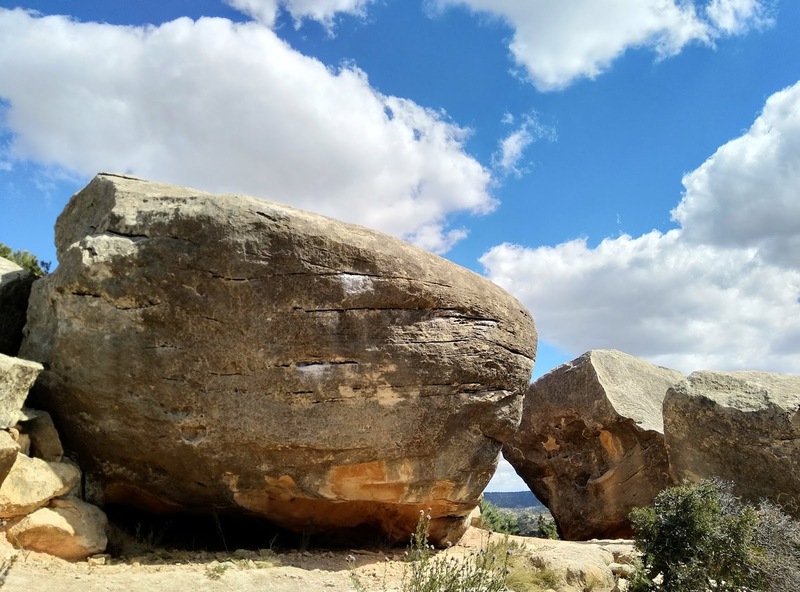 What's the best time to go bouldering in Alcañiz? Some might say, that the weather in Alcañiz is suitable for bouldering from autumn to spring. According to the statistics, temperature in Alcañiz hardly drops below 0 °C even during the winter, and the precipitation is one of the smallest in Europe. Me and T have only visited Alcañiz in the spring, though. 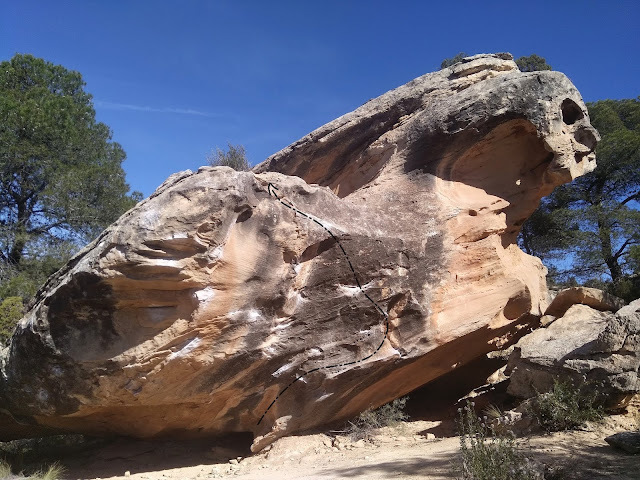 On clear and still days it requires a bit of planning to be able to enjoy the help of friction, but otherwise February and March have been favorable for bouldering in Alcañiz (at least this year). Nightly temperature has been below 0 °C on only a couple of nights during our stay. 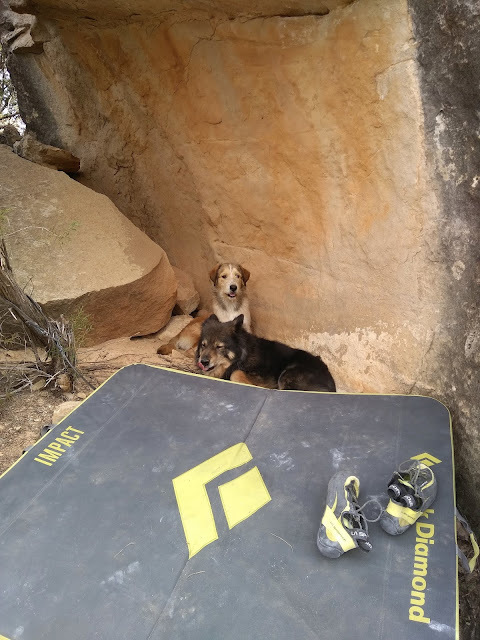 Despite the much more camper-friendly climate than in Albarracín, fog or wind can make bouldering in Alcañiz very unpleasant ‒ not to mention the heat during the summer. All in all I'd say, that I've enjoyed bouldering in Alcañiz. The weather is generally nice, the town and landowners feel welcoming and what's most important: there's plenty of great boulders for building up some strength! Keep on polling the blog for more helpful tips for bouldering in Alcañiz – part 2 will be out in just a few short weeks.